There are a lot of benefits from eating whole grains, but for some it is hard to incorporate into their daily routine. I used to eat the same thing for breakfast, but now I look at breakfast like any other meal. I still try to keep things no-fuss to save time in the morning, but I can be equally creative as I am for lunch and dinner. This revelation came when I realized I could enjoy breakfast leftovers, where I might make something a bit more ornate in the evening and chow down the following few mornings. Granola is a prime example of this. 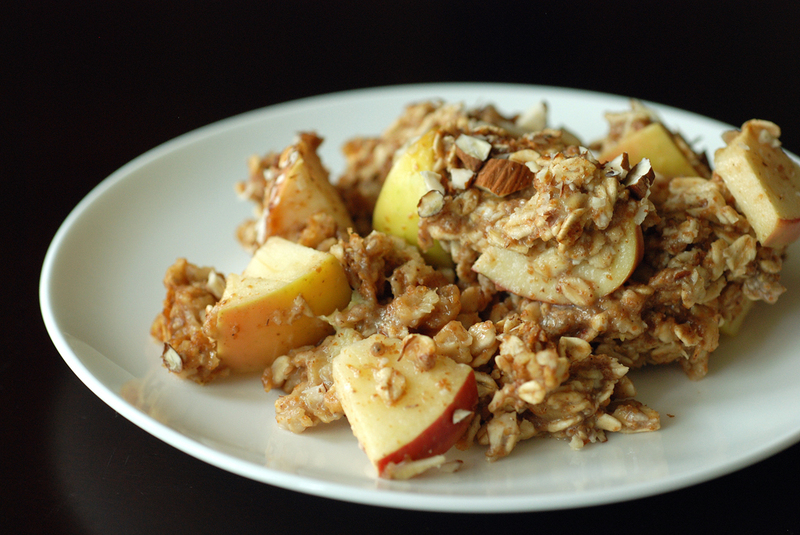 Baked oatmeal is delicious but even stovetop oatmeal can be easily reheated the following day. But why limit yourself to oats? Last year, I made a breakfast couscous with almonds, coconut and honey and here is a creamy breakfast porridge with quinoa. 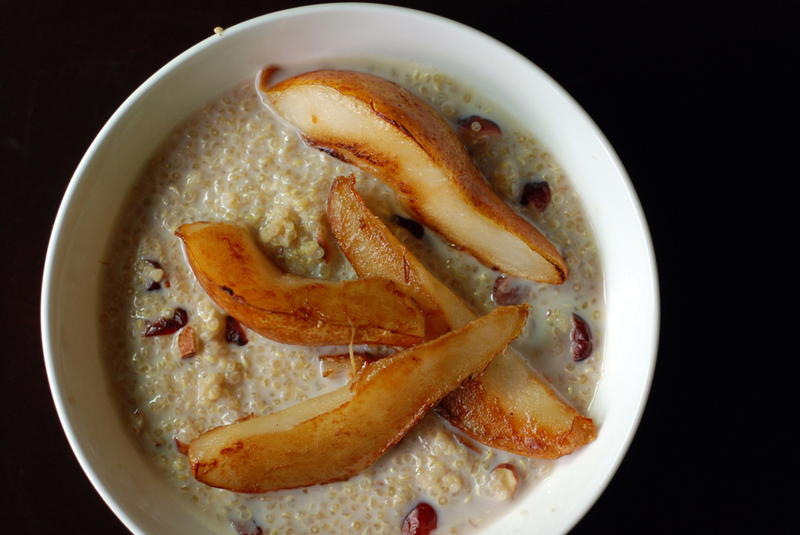 Quick and tasty, this milky quinoa porridge is topped with ripe, soft pears sautéed in a touch of olive oil. 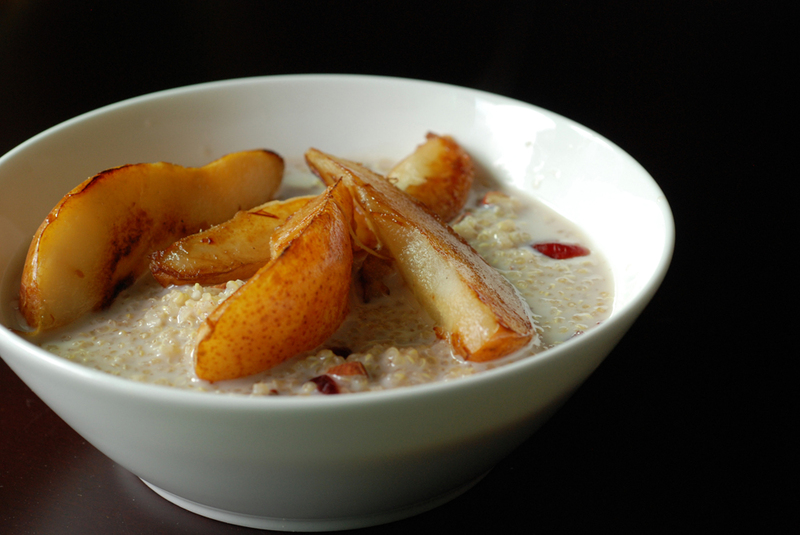 Depending on how sweet your pears are, you may not need to add any additional sweetener. 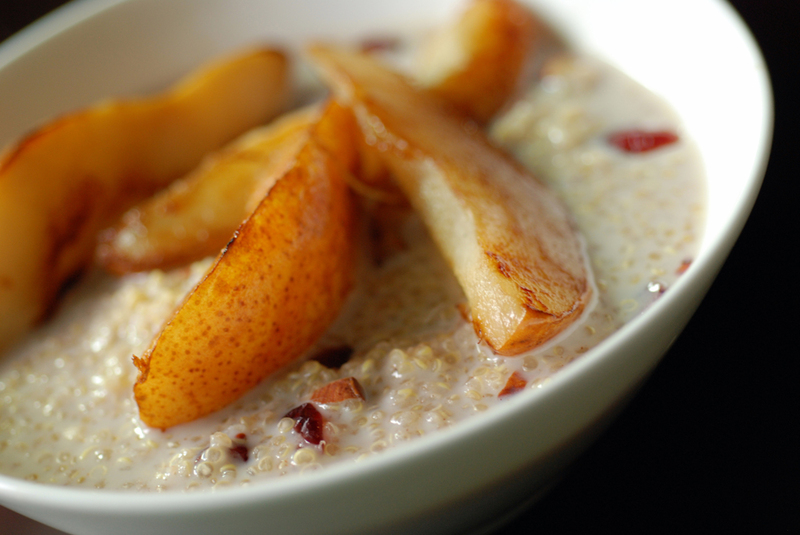 You will have to warm your stove to make this breakfast, but it is delicious. This recipe was adapted from Bon Eats, who adapted it from Feasts and Fotos and is my submission to this round of Blog Bites 9, holiday buffet, potluck-style! I could be described as quirky. I don’t think that’s a bad thing. One thing that still baffles most people is that I don’t own a cell phone. I have a landline, but refuse to convert to a cell phone until the reception and reliability have improved. For now, I am content with my landline. When I serendipitously stumbled upon fresh cranberry beans the other week, I couldn’t remember how many I needed. 1 cup? 2 cups? Well, I bought 4 cups just to make sure I wasn’t short. 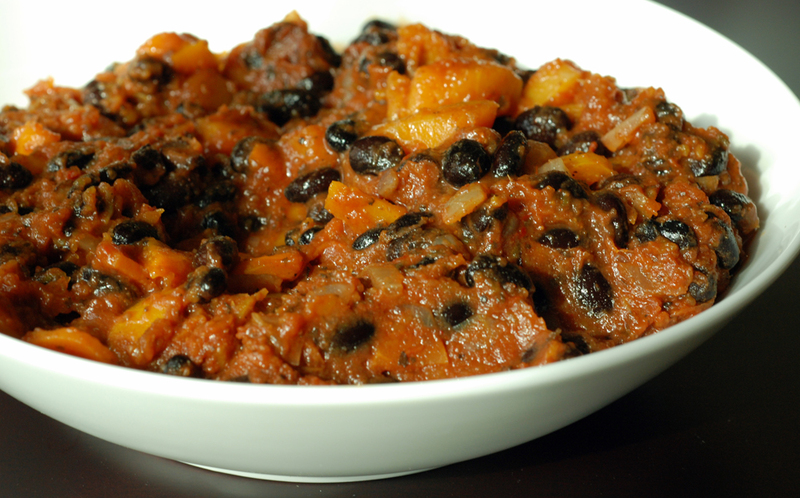 Suffice it to say, the cranberry bean mole with roasted butternut squash only needed 2 cups of beans. So I searched out other ways to use my creamy fresh cranberry beans. It turns out they are also common in Turkish cuisine, which is one of my favourites. 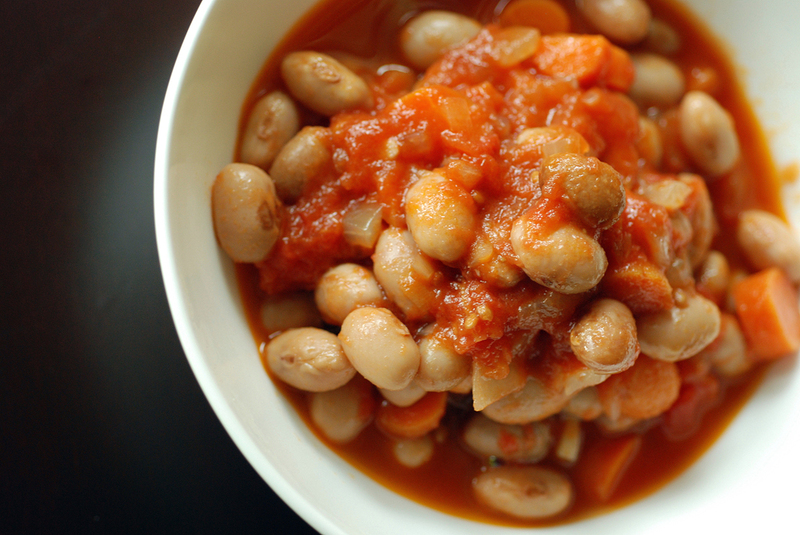 Beans simmered in tomato sauce may sound bland, but I knew it would be anything but if it were a Turkish recipe. I worked with Esra’s recipe at Carte du Jour and modified it slightly to use less oil and added more garlic. Her recipe is fantastic because it includes a lot of possible substitutions. A plate of beans may not sound that exciting, but I enjoyed them. This was a lighter dish, and while other recipes don’t necessarily add the water during the simmering, it made it a bit more saucy which I enjoyed. It would be nice to try this again without the extra water and without the sugar. Keeping with the Turkish theme, I paired the beans with fine bulgur for a complete meal. I have talked about the nutritional superiority of bulgur compared to brown rice before, and it is incredibly easy to make as well (7 minutes to “cook” in boiling water). Mixed all together, the sauciness coated the bulgur nicely for a light yet hearty meal. I love bananas, but sometimes they go brown a bit faster than I’d like. That’s ok, though, because bananas are great for baking. My first instinct, is to make the gorgeous apple banana cake (the bananas entirely replace the butter and oil) or the delicious banana oatmeal chocolate cookies (no butter, no eggs, no flour and no added sugar). I have also used ripe bananas to make a super fluffy and creamy stovetop oatmeal, and I thought it would be great to turn my baking escapades towards breakfast: let’s make baked oatmeal even healthier. 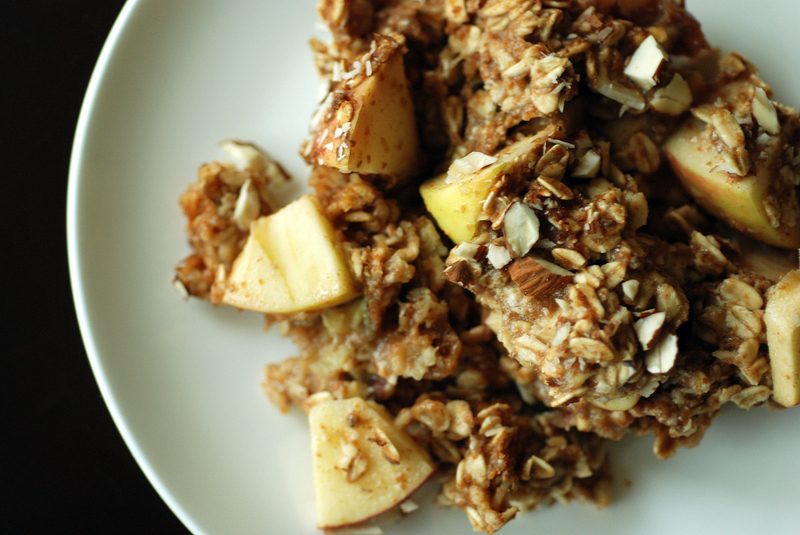 Baked oatmeal is a way to get that creamy goodness of oatmeal for multiple servings. Whether you want to serve a small army or in my case, feed me all week. You can be equally creative with baked oatmeal, adding in your own favourite fixins and flavours. Because I am trying the vegan route this month, I wanted to highlight chia seeds as an egg replacer. Here, I mixed 1 tbsp of chia seeds with 3 tbsp of warm water, and set it aside to soak for 10 minutes. You get a goopy mess, but it works well. I didn’t need to crush my seeds, either. This is my submission to this week’s Weekend Herb Blogging hosted by Anh from Food Lover’s Journey and to this month’s Breakfast Club for baking. I have a mighty fine selection of spices, if I may say so myself. A huge thank you goes to my last trip to Penzeys, and also to Bestwin which has a multitude of cheap ethnic spices. Fresh spices make a huge difference when cooking. Spices don’t keep long, which is why I only buy the spices I need. I make my own garam masala and now I will show you how to make your own chili powder. For the spice-sissies like me, this is yet another way to flavour the heat levels to your own liking. There are many recipes for chili powder, but I went with a flavourful blend with smoked paprika, cumin, coriander, oregano and garlic powder. You can add as much real chili your taste buds will desire, but I stayed with my flavourful (not hot) Aleppo chili flakes from the base recipe. The deconstructed recipe has been incorporated into the chili recipe below. Definitely play with the flavours until you get something you like. 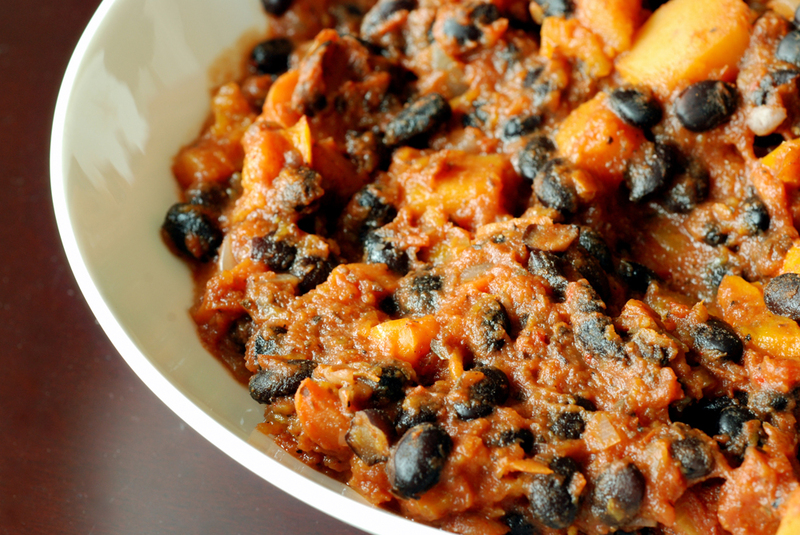 This is a Hallowe’en themed chili, filled with all things black and orange, adapted from Party Vegan (recipe also posted here). Of course, I couldn’t just do a simple, traditional chili. This one is filled with butternut squash and the secret oomph comes from the apple juice. Its sweetness allows you to dial up the heat higher than you might otherwise. Personally, I thought it was great. 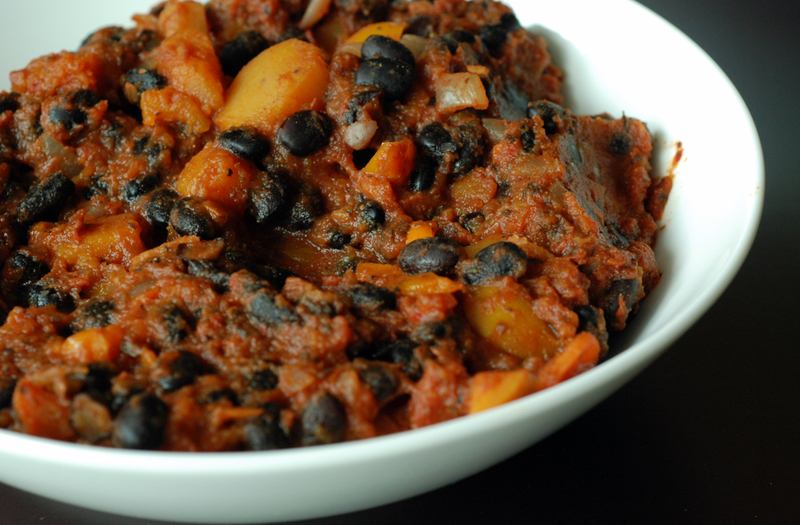 Different than the ordinary, and the squash worked well with the black beans. 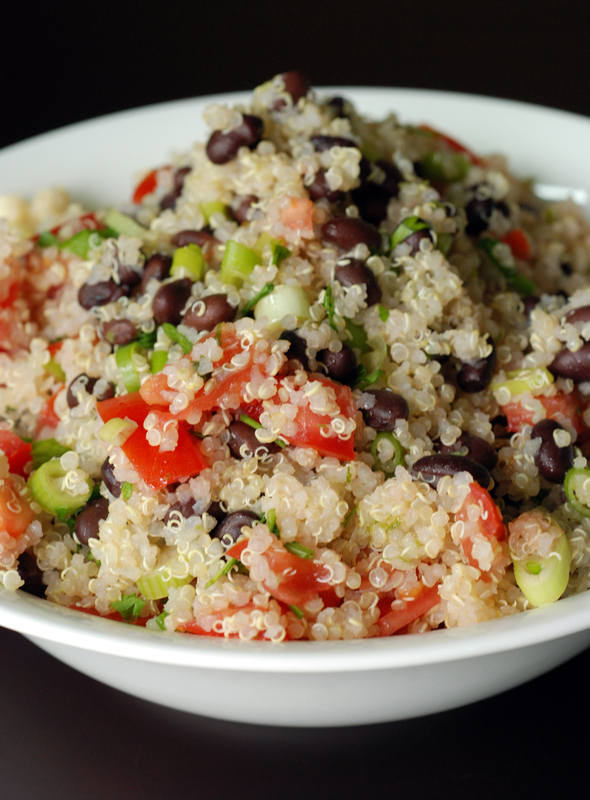 Continuing with our quasi superfood theme, now is the time for quinoa to shine. Also hailing originally from South America (so was amaranth), quinoa was called the mother of all grains by the Incas. Technically it is not a whole grain, rather the seed from the goosefoot plant. It has gained notoreity as an excellent plant-source of complete protein. Wheat and rice are low in lysine, which is why they need to be paired with beans to get the complete set of amino acids to form protein. It is also high in fibre, B vitamins, gluten-free and supposedly easy to digest. I have cooked with quinoa before, but I had had issues with it in my pre-blogging days. You need to wash it thoroughly before you cook it to remove the soapy/bitter-tasting saponins that are naturally present in the seed. Most of the time, this has already been removed during its processing, but I am convinced I had a bad batch once (I blame Bulk Barn!) and I shunned quinoa for quite some time. Now that I buy organic quinoa through Bob’s Red Mill, I haven’t had any problems. It is easy to substitute quinoa anywhere you’d use rice and just as easy to prepare (2:1 boiling water:quinoa and simmer for 12-15 minutes). You can even make it in a rice cooker. 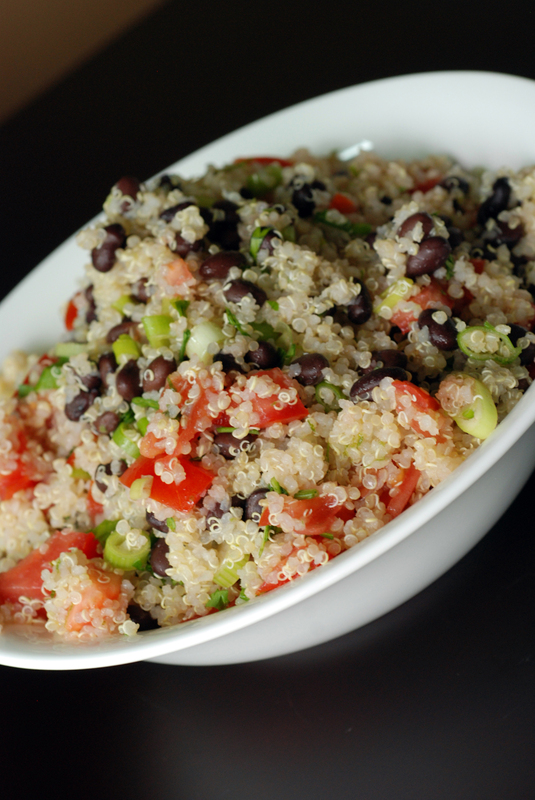 Here, I made a Mexican quinoa salad bursting with flavour from tomatoes, green onions and black beans with a minty-lime vinaigrette. The flavour depends entirely on the flavour of your fresh tomatoes. The dressing is a bit subtle, but a nice supporting cast. The salad is deceivingly filling, so I ate it as a main course salad. Now I know I just told you how easy it is to boil your quinoa, but the directions for this salad were courtesy of Gourmet (July 2007). First, you partially simmer your quinoa and finish the cooking process with steaming. This made the most fluffy quinoa I have ever had. 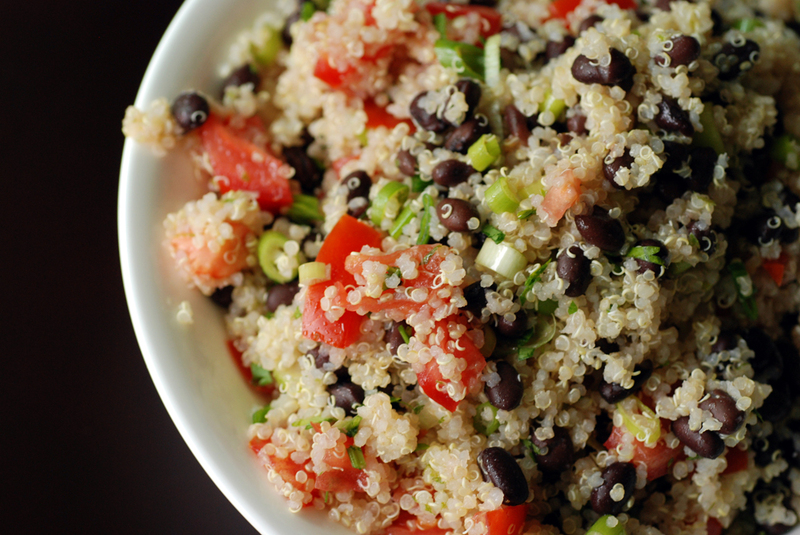 If you have the time, this is the ultimate way to prepare quinoa. This is my submission to this month’s My Legume Love Affair, hosted by Lisa’s Kitchen, to this month’s No Croutons Required featuring quinoa, to Ivonne at Cream Puffs in Venice for Magazine Mondays, to Torview’s food palette series featuring red and white dishes, to Deb for this week’s Souper Sundays, and to this month’s Cooking with Whole Foods, featuring quinoa. Toronto has a lot of burrito restaurants. I have been to a few places, but my favourite sandwich remains the yam burrito at Big Fat Burrito. I used to gush about them at work, where our Monday lunches were burritos from Big Fat Burrito. It turned out to be a bad idea, because we started to run out of the yam burritos. I haven’t eaten a burrito in a while, especially after I found out that the steak burrito at Burrito Boyz is over a pound of food, and over 1000 calories. Chipotle fares no better, clocking in at over 1200 calories if you include guacamole. 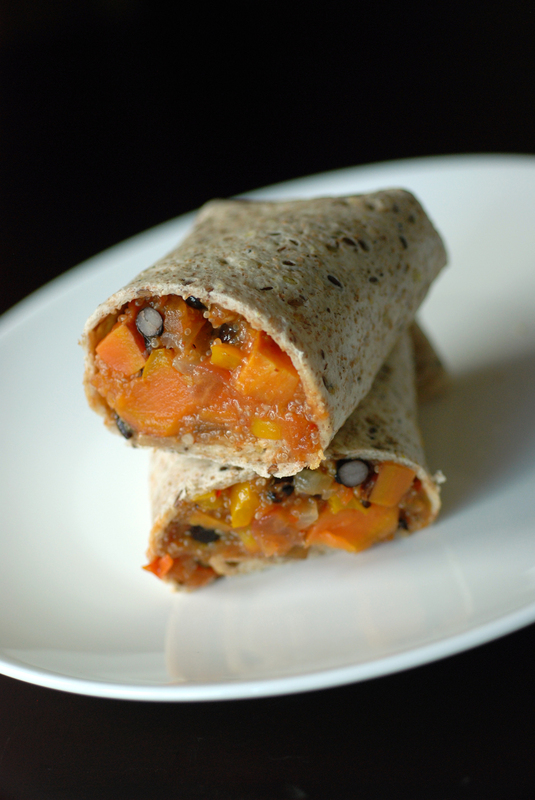 However, when I spotted this (since adapted) recipe in Bob’s Red Mill Cookbook for yam, black bean and amaranth burritos, I knew I had to give burritos a second chance. Making them at home meant I could make them healthier! 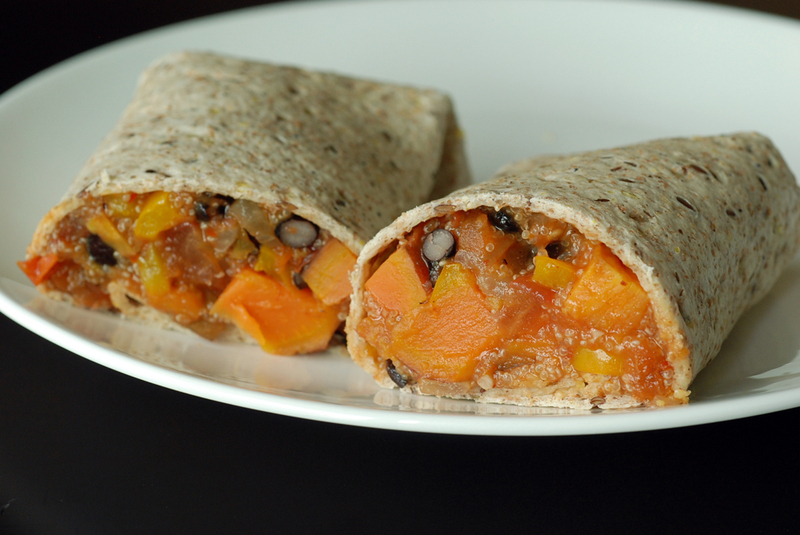 Including a touch of sour cream, these burritos are around 550 calories, but it all depends on the tortilla, salsa and added fixins you use. Next time I make burritos, I will try to search out freshly made tortillas from La Tortilleria. Sometimes, though, I ate this more like a stew, sans wrap. 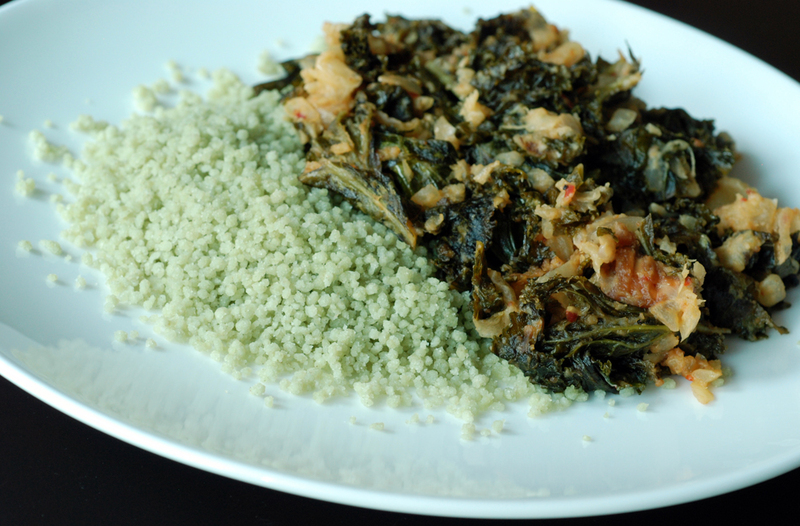 Amaranth is an optional ingredient, but if you have it, this is a great way to incorporate it into your meal. Amaranth is one of those up-and-coming superfoods. It is an ancient South American seed loaded with protein, fiber and minerals, akin to quinoa. It has a slightly nutty taste and can be quite sticky. It works well as a binder in these burritos. Amaranth has an interesting history, as it was believed to have superpowers and was given to the army for increased energy. Furthermore, it was used during religious ceremonies as effigies, and thus was banished when the Spaniards invaded Mexico. It has only been rejuvenated within the past few decades and still remains relegated to health food stores (I found mine in bulk at Essence of Life but have also seen it at the St Lawrence Market at Lively Life Fine Food). This is my submission to Ricki and Kim’s vegan SOS challenge featuring sweet potatoes, and to this month’s My Legume Love Affair, hosted by Lisa’s Kitchen. November is special in many ways. Of course, there is Remembrance Day. For some, it is a month to grow a moustache in support of raising funds for prostate cancer research (aka Movember). For others, it is a celebration of vegan food through almost daily blogging (aka Vegan MoFo). I am neither a vegan, nor a vegetarian, nor do I plan to write 20-30 posts this month about vegan food. In fact, most of my vegan recipes are serendipitous as I search out healthy recipes. But I figured I’d pay homage to Vegan MoFo by posting vegan-friendly dishes all month. So far, so good (and I bet you may not have noticed they were vegan!). In fact, I wanted to take things a bit further by going where few non-vegans have gone before: making vegan “meat”. 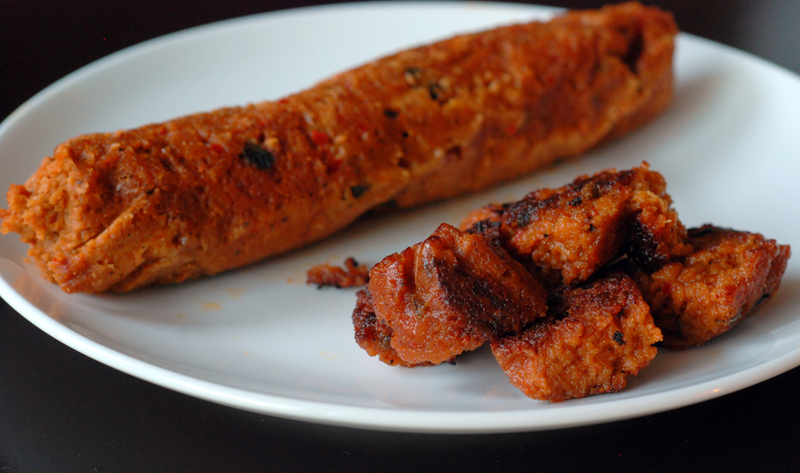 Yes, I made my own homemade sausages… without any meat! Adapted from Viva Vegan, you mix and knead together vital wheat gluten and some chickpea flour with some vegetable broth and olive oil and a ton of flavourings: tomato paste, garlic, cumin, coriander, Mexican oregano, chili flakes, smoked paprika, nutritional yeast, and if you like it hotter throw in some cayenne and peppercorns. I am not particularly familiar with chorizo, so I can’t say how close these are to the real deal. They were a bit soft right out of the oven but firmed up slightly after sitting in the refrigerator overnight. They were scrumptious, though! Little dumplings bursting with flavour. Nearly entirely filled with protein, at that. I added them to the Brazilian Potato-Kale Soup and it definitely brought it to the next level. I was fishing out the chorizo for each bite. It was delectable. This is my submission to this week’s Weekend Herb Blogging hosted by Susan from The Well-Seasoned Cook. My cooking escapades have brought me to the emergency department twice. Both times for cutting myself deep enough such that it wouldn’t stop bleeding. If your cut doesn’t stop bleeding with pressure after 15 minutes, you need to get yourself some help. 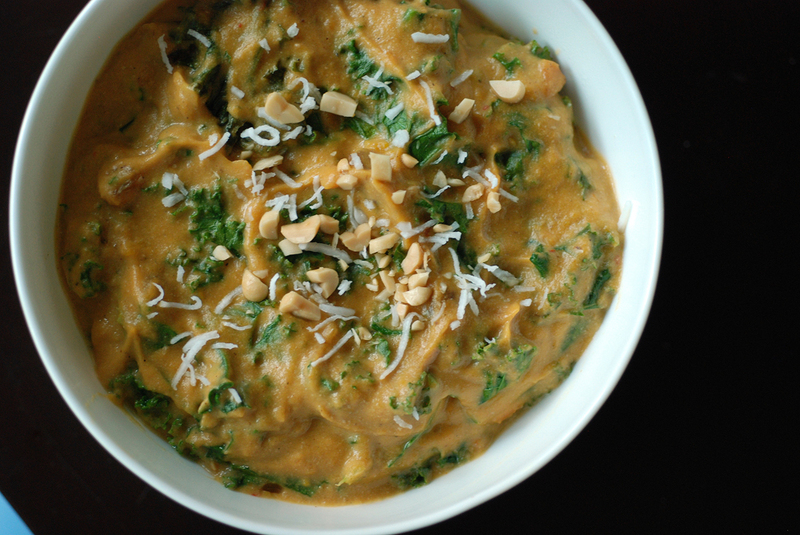 The first time I cut myself, three years ago, was when I made a similar potato-kale soup. I was chopping my potatoes, sliced and then stacked, when the top one slipped out from underneath and I ended up chopping my finger instead. Sharp knives don’t cut you, dull knives do! And sadly my dull blade made me use a bit too much force. I was in the middle of making a soup, so I put on a makeshift pressure bandage and finished cooking. Thankfully the soup was so easy to make, I could do it single-handed. I was still bleeding nearly an hour later, so begrudgingly, I hiked over to the urgent care center where I got a few stitches. I thought I learned my lesson about dull blades, so when my parents visited next, I used their sharpener to get some smoking sharp steel. However, last year, I ended up in emergency yet again. Secondary to dull blades chopping rhubarb for a strawberry-rhubarb pie. Rhubarb can be tough sometimes! I kept bleeding after 15 minutes, and this time I didn’t bother to finish making my pie before trekking over to the emergency department. I popped my pie dough and filling into the fridge and sat patiently for 4 hours for some glue to heal my cut. When I returned, I discovered the secret to crispy pie crusts: chilling that dough. This was the same tried-and-true “Never Fail” pie crust recipe from the back of a Crisco container my mom uses, but she even conceded how much better the crust was this time. So light and flaky. Three strikes and you’re out, right? Two times, no more! I knew what my problem was. I love my knives dearly, but since I use them so often I need to keep them sharp. I figured I would splurge and buy myself a good knife sharpener, the one recommended by America’s Test Kitchens. It may cost $150, but if it saves me another trip to the emergency department, it would be worth it. I am pleased to report that since then, I have been cut-free. I even tackled this potato kale soup without incident. 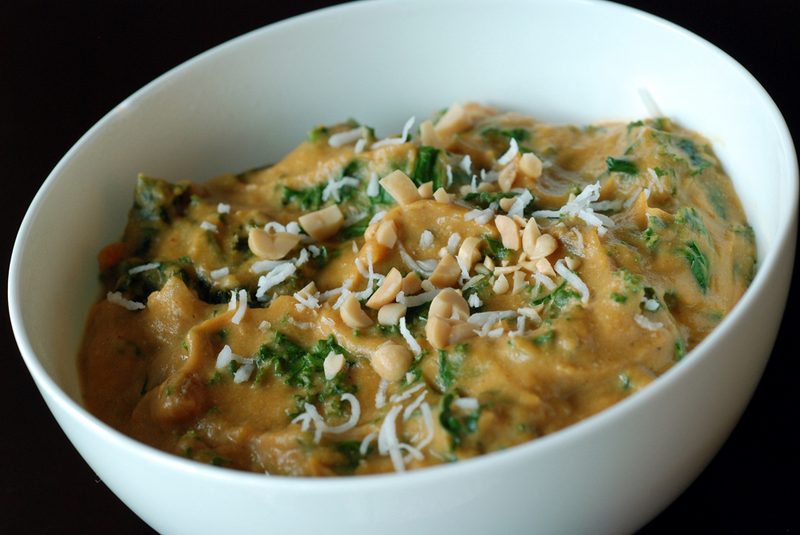 But back to this soup: it is a healthy, hearty soup adapted from Viva Vegan. 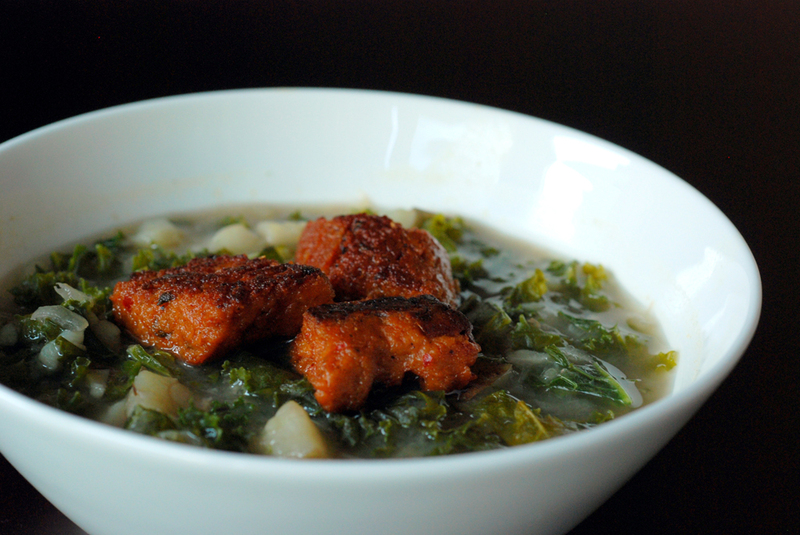 Caldo verdo literally translates to green soup and kale is a center star in this soup. The potato mashes down into a creamy base and there is a subtlety of flavour from the thyme and oregano. This soup is Portuguese in nature, and Portugese cuisine is very prominent in Brazil as well. 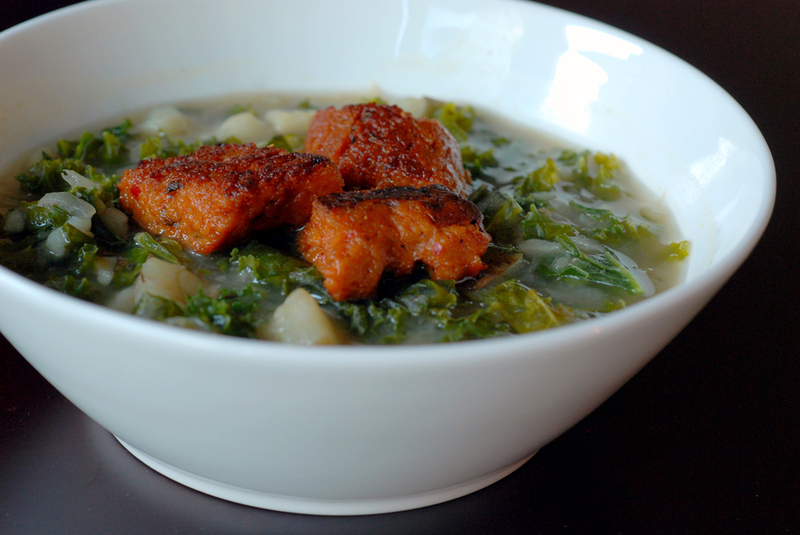 It would be a nice, simple soup without the chorizo, but it is downright tasty with the chorizo. And yes, this soup is still vegan! 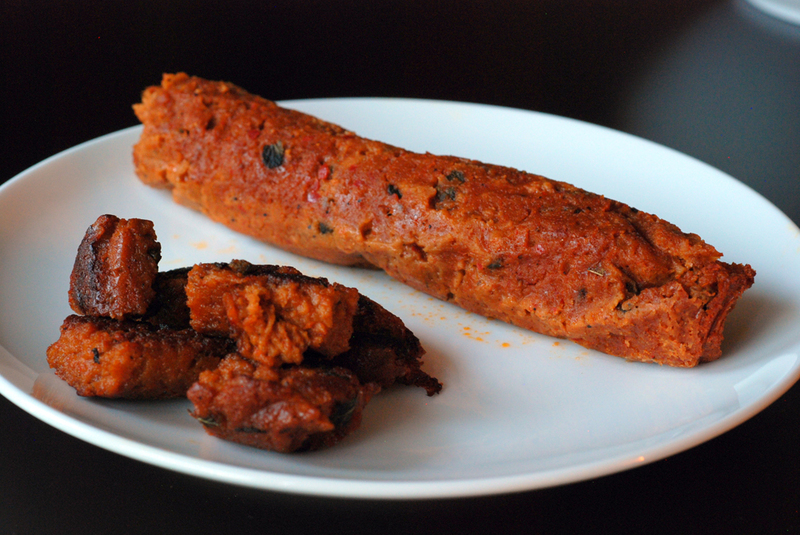 I used homemade chorizo sausages for a definite flavour boost (recipe here). This is my submission to this month’s Regional Recipes, featuring dishes from Brazil and to Deb for this week’s Souper Sundays. I have been apprehensive of curries for a long time. I do not like curry. Rather, there is something in curry powder I do not like. A bit earthy, definitely spicy. I still haven’t figured it out. It may just be the chili pepper! I enjoy Indian food, though, and bought 660 Curries by Raghavan Iyer to help me conquer my fear of curries without the use of curry powder. I simply omit the peppercorns and add Aleppo chili flakes to my liking. 🙂 Browsing through the cookbook, you realized this is a cookbook of authentic Indian dishes along with contemporary dishes with an Indian spin. And they are all considered curries. The word “curry” doesn’t exist in the Indian vocabulary. Authentic Indian dishes do not call for curry powder, either! So what is a curry then? Iyer describes it as any dish which is simmered with a sauce/liquid with spices and herbs, which can be pretty much anything. Hence why this dish is considered a curry. And I didn’t even know it until after I sat down to eat it. In my quest to find interesting ways to use my large bunch of kale (superfood #1), I stumbled upon a vanilla sweet potato and kale soup by KathEats. I adapted it by swapping some of the sweet potato for butternut squash. I inadvertently added more coconut milk (my can was 19 oz, but I think 14 oz is the standard size) and instead of using garam masala, I made my own spice blend, loosely based off of Lisa’s post. This was supposed to be a soup, but it was too thick to be a soup and too saucy to be a stew (although it technically could be considered a stew since everything was stewing). In the end, we christened it as a curry due to its Indian-flavoured spices and use of coconut milk. Regardless, this was delicious. DELICIOUS. It was sweet, savoury, spicy, and salty. It was hearty, yet creamy. It was filling. It was everything great. Just not a soup. The sweet potatoes and butternut squash cook down to a sweet hearty broth, aided by a blender. Coconut milk permeates along with the sweet/spicy flavours of the garam masala – cumin, cardamom, cloves, coriander, cinnamon and nutmeg – with a kick from Aleppo chili flakes. I almost thought to leave this as a nice soup after blending it, as it tasted great. But I am glad I persisted, because the kale was a delight. Chewy and full of texture. The vanilla worked well and the raisins were like hidden treasures, sweet jewels popping up in every few bites or so. I am sure this would still be nice as a thinned soup, but served with rice, the textures balanced out nicely. This is my submission to Ricki and Kim’s vegan SOS challenge featuring sweet potatoes and to this month’s Ingredient Challenge Monday for coconut. I love to know how people choose their recipes. Especially food bloggers who tend to try a variety of food. I scooped up a few butternut squashes when they were on sale, and they are great because they don’t take up coveted refrigerator space. I can plot and determine a strategy to use them in my cooking. What will I make first? Ina Garten’s Roasted Butternut Squash Salad with a Warm Cider Vinaigrette? Smitten Kitchen’s Squash and Chickpea Moroccan Stew or her Spicy Squash Salad with Lentils and Goat Cheese? 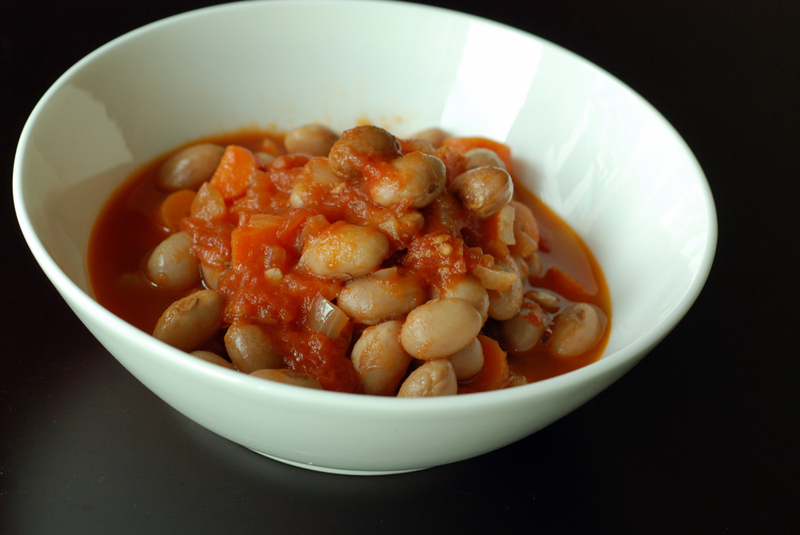 The New Spanish Table‘s Lentil and Pumpkin Stew with Roasted Garlic? Joanne’s Tofu, Tempeh and Squash Peanut Butter Mole? Ottolenghi‘s Roasted Butternut Squash with Burnt Eggplant and Pomegranate Molasses? Fat Free Vegan’s Lemony Quinoa Salad with Butternut Squash? 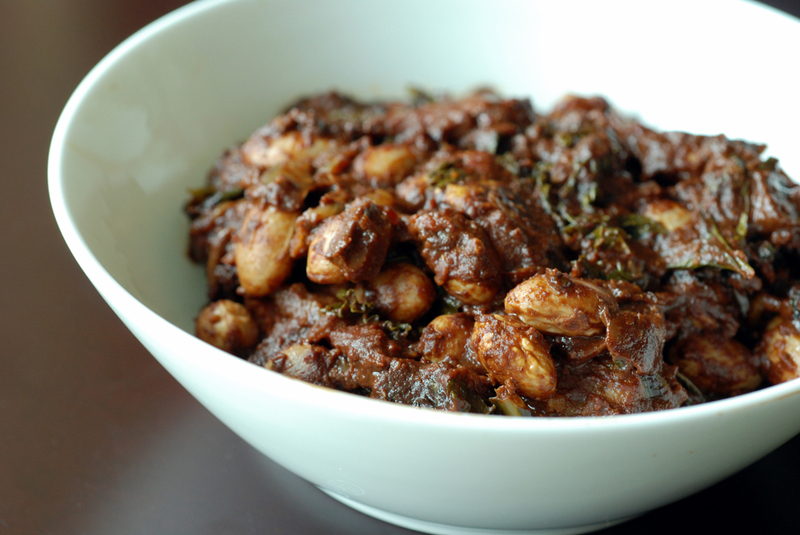 101 Cookbook’s Borlotti Bean Mole with Roasted Winter Squash? There are so many options to mull over as squash season starts up again. My favourite part of St Lawrence Market is the Saturday morning farmer’s market in the North building. For early risers like me, it is great because it is probably one of the only places to buy groceries at 6am in the morning! 🙂 I spotted a bunch of kale for $2. Let me not fool you, this bunch was HUGE. It could not fit into my bicycle pannier, it was that big. It did not even fit in my refrigerator. I had to store it outside on my balcony! 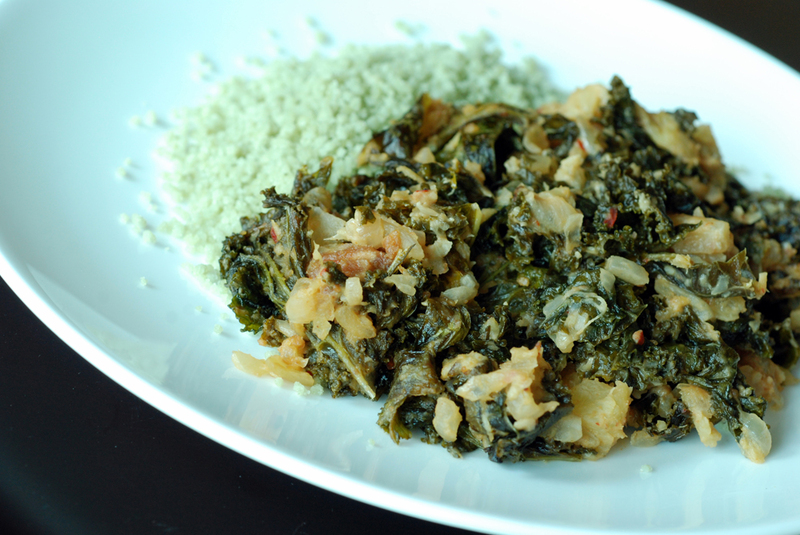 And when I measured out 3 oz of kale for this recipe, I needed one leaf. Just one leaf! While I generally am a bit apprehensive with traditionally spicy dishes, I really enjoyed this. I modified Heidi’s recipe (who in turn adapted it from Wild Garlic, Gooseberries and Me) to increase the beans and squash, and I used Aleppo chili flakes instead of the jalapeno peppers. The chocolate softens the spicy kick. I otherwise kept things the same and really enjoyed it. It takes a while to make, at least an hour prep, with a further 2 hours of slow cooking, but you have a wonderfully fragrant meal. I think you could skip the 2 hour cooking time, if you really need to. It would still taste great. Everything was basically cooked before it went in and when I snuck in a lick before I popped it into the oven, it was very tasty. It was also slightly colourful at this point. Two hours later, the flavours were more robust, deeper, darker and savoury but it was still great beforehand. The cranberry beans are creamy, the squash is sweet, the kale has a slight bite to it and it is smothered in a spicy chocolate sauce. Who says you can only have chocolate as a sweet treat? It is wonderful savoury as well. 🙂 Enjoy! This is my submission to this week’s BSI featuring chilies and to this month’s My Legume Love Affair, hosted by Lisa’s Kitchen. Last month my mom dropped off a huge container of pearl barley. ‘Did you want some?’, she asked. Well, I didn’t want it to go to waste, and I love whole grains, so of course I agreed. But the next question was what to do with it. I really like this French barley salad, but I also enjoy trying new recipes. When I made Happiness Soup, I replaced the rice with barley which worked out really well. So when I spotted a recipe for Eggplant and Cashew Barley on Cate’s World Kitchen, it looked so fragrant and fresh with the heartiness of barley. 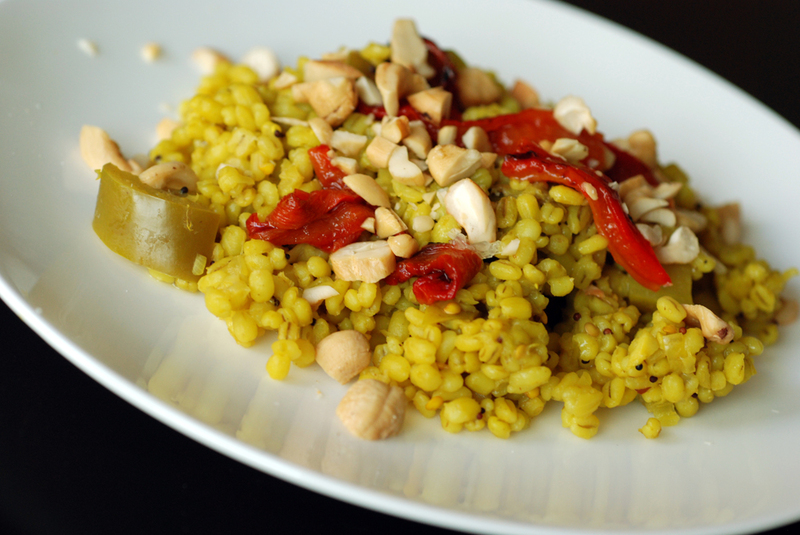 She had also replaced the rice from the original recipe (from Fresh Indian by Sunil Vijayakar) with barley. I enjoyed this dish, with the savoury Indian spices including cinnamon, cardamom, chili pepper, mustard seeds and bay leaf. It wasn’t spicy because I didn’t add many chili flakes, and would likely increase it next time. 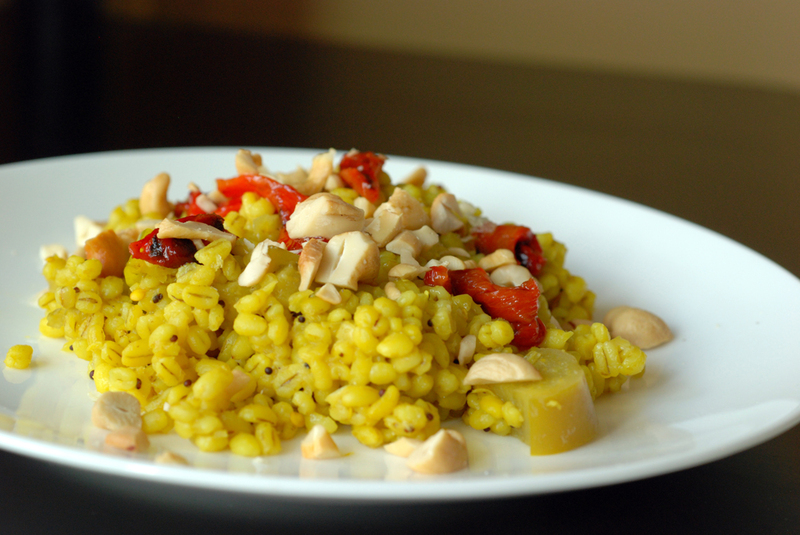 I found the sweet roasted red peppers worked well with the savoury barley, the creaminess from the cashews, and the touch of lime juice added that extra flavour kick. The eggplant was more in the background, but worked well with the dish. I really enjoyed how plump the barley was, because I was worried it would be more saucy like a barley risotto. This is my submission to this week’s Weekend Herb Blogging hosted by Cinzia from Cindystar.